Ornamental grasses can be just the right addition to any yard or landscape because they are easy to grow, low maintenance, practically pest-free and don’t mind poor soils. They are often used to form borders or hedgerows, can be a backdrop or a screen, they look good with native landscapes and they are interesting and beautiful in their own right. 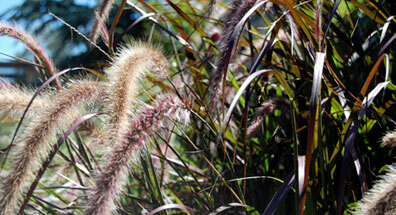 There are both annual and perennial varieties of ornamental grasses that come in various heights, shapes and colors. Most prefer full sun, but partial shade may be an option. Various grasses require different amounts of water and most will grow in just about any kind of soil.In late summer and early autumn the grasses are truly ornamental beauties, showing off their plumes which continue to be attractive and add landscape interest throughout the winter. Those plumes are their seed heads, but the seeds are sterile so the plants do not become invasive. A cool-season grass, growing during spring and fall. It thrives in full sun in dry, loose, sandy soil. 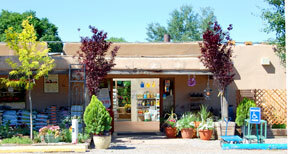 It is drought-tolerant, but it is not suited to poorly drained sites. 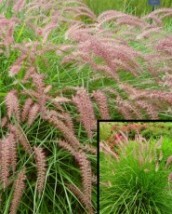 Widely used grass for variable leaf color, arching form and persistent, whisk-like flowers. 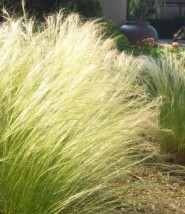 One of the most – and longest-used grasses in American gardens. Many varieties are available varying in leaf color, size and texture. A warm-season grass that is adapted to a wide variety of soils and growing conditions. It thrives in full sun, endures drought well, and flourishes in poor, gravelly soils. Prefers loamy soil, full sun, and plenty of water. It is a warm-season grass, but is hardy except in extremely cold areas. The underground runners invade adjacent ground in light, sandy soils, but less so in heavier soils. A drought tolerant, warm season grass found naturally throughout nearly all of New Mexico, except for the drier desert areas. The plants are winter hardy and accept a variety of soils and water conditions, but do best in full sun and rather dry soils. A warm-season grass, preferring full sun in well-drained, moist to wet soil. Plants are hardy throughout the state, but dieback during winter and lack of flowering should be expected in the colder regions. will thrive in loose, well-drained, lime soils. The plants are cool-season, but also drought tolerant. 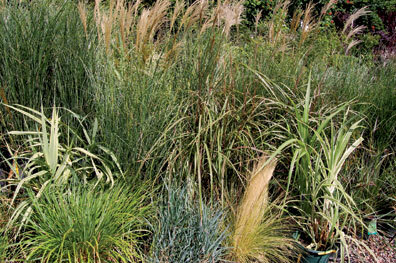 As we build Payne’s Plant Library, we will feature each of these grasses separately as well as grouped as Ornamental Grasses. For now, here are some of our most popular varieties.